I loved the positive approach to building relationships with students. I would recommend this course to other coaches. It is worth the time and it is easy to take this course along with a busy schedule. This course gave me valuable strategies to improve my personal relationships with my athletes, coaches and parents. It teaches coaches how to be a coach, not just how to coach. I have already recommended this course to other coaches. It will make a difference. I really appreciated the videos in the first three sections. I've taken notes and added them to my coaching philosophy. I'm aware and more intentional in the actions I take and the words I use. I absolutely recommend this course to other coaches. Yes! I recommend this course to other coaches! I give this course a 10/10. I really enjoyed the videos on dimension 2 & 3. I honestly can't think of one thing that was THE most valuable part of this course. I enjoyed every aspect of the 2nd and 3rd dimensional aspects of the curriculum. I would recommend this course to other coaches without a doubt! One of the most applicable and useful classes and curriculum that I've been associated with. Every coach who aspires to grow and make a difference in the lives of their players need to take this class. This class is a GAME CHANGER. I did a lot of soul searching with regard to every aspect of my program and how I coach our players. I've grown tremendously through this journey of 3D coaching. This course was spot on with what I needed to hear, I would recommend it to other coaches. It taught me to trust my instincts and never stop learning from other great coaches. What was most valuable about this course? First of all awareness - We get so wrapped up in the coaching process, that we sometimes don't see the forest through the trees. Secondly, the development of my transformational coaching purpose statement. Thirdly - strategies for implementation. I would absolutely recommend this to other coaches! 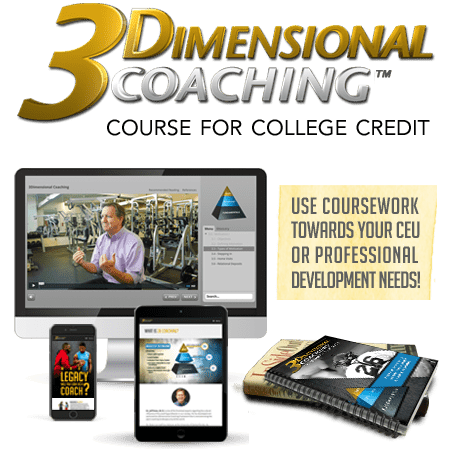 I have seen this course change the lives of so many coaches, both young and veteran. I had to introspect and understand my own story in regards to athletics and why I do some of the things I've done. Eye opening for sure! I would recommend to all coaches. If all coaches could move even a little closer to transformational vs. transactional our sports culture would be better off. I would absolutely recommend this course to other coaches. The most valuable parts were the self reflection, content and the process strategies. The most valuable thing I got out of this course was the understanding that coaching is not all about the x's and o's. It reaffirmed to me that building lasting relationships with your players and going above and beyond what is expected as a coach really means a lot to your players. If you can capture the hearts of your players they will play harder for each other and learn life lessons along the way. I would definitely recommend this course to other students/coaches because this is how coaching should be done. Everyone has experienced a first dimension coach and how that made them feel and need to understand that coaching is much more than just putting game plans together. The most valuable thing I got from taking this course is the strategies for transforming athlete's lives. I've always tried to approach coaching from a relational point of view, but I struggled some with different strategies to accomplish my goals. The strategies offered in the course are an awesome resource that I will take advantage of in the future. If someone is interested in coaching, this is the most important class they will take. The class material is exactly what coaches need to hear to transform people's lives and not just be in coaching for the wins. I have always been confident on teaching girls on a physical level, but this course helped me think outside of my comfort box. It helped me realize that the way to coach girls on a more successful level is a lot more than their physical skills on the field. Girls will respond to me better if I show I care on a much deeper level. I believe girls respond better on an emotional level of coaching. I would recommend it to anyone who has any desire to coach at any level. I liked that it could be applied to any level of coaching, not just college. I would recommend this course to other coaches because it widened my knowledge and gave me more ideas on how to be an effective coach. There were many valuable aspects of this course. The strategies on how to implement the various parts of each dimension, and then InSideOut Coaching really brought it all together. We as coaches have the platform to impact many many young boys and girls. This course not only gives you a plan to get the most out of your kids but also the WHY. This course is a very good tool, especially for coaches who are young and all they think about is 'winning.' It was valuable to learn how to make your athletes feel like they are more than just a player. I think that coaches have a great impact on kids more then they really know and need to have a plan on how they will coach. This class really showed me how to develop my plan. This is a life changing course that will have instant effect on your coaching techniques and on your life. Learning how to coach in a way that is so much more to the athletes and understanding that I have a huge impact on the rest of the people I meet and how to make not just good athletes but good people was very valuable. The most valuable thing I got from this class was how to appeal to the 2nd and 3rd dimensions to every player. I knew I wanted to coach at a deeper level I just was not sure how to do that. I would recommend this course because everyone can take something from this class it is not just a class focused on one thing and this is applicable. The saying 'One coach will impact more young people in one year than the average person does in a lifetime' really stuck out to me. The whole class was really based around this whole saying and how we can better motivate and coach to the heart of these young players. This is something I will think of for the rest of my coaching career in that we really do have an impact on these players and we decide whether we want that to be a negative impact or positive. I feel this next generation is going to need to be taught and coached this style of coaching. Coaching from the heart to make the players play with heart is really important. We as coaches need to realize the power and influence we have on these players and that we can either make or break them. Learning the 3-D method makes you realize how much different of an experience you can allow your athletes to have. This course was validation that what I was already doing as a coach was right, but it also gave me more ideas of things I can implement into my program to make it better. I would recommend this course for every coach. It's a great tool to help coaches remember the right reasons of why they coach. It was valuable seeing better ways to approach situations I am in every day. It opens the mind of the coach and allows them to think in a different way. I would recommend this course for sure. This course opened my eyes to how much impact a coach can truly have. The ideas and strategies to get coach each player to the best of their ability on and off the field was very valuable. The format was very user friendly. The instructors were knowledgeable and interesting... I learned a lot!!. This course forced me to re-evaluate the way I coach and gave me good strategies to improve. I would recommend this course to other coaches. It's a great way to learn ways to connect with athletes. I enjoyed the strategies for parents a lot. I had a lot of parent issues last year because of underclassmen playing over seniors or those entitled families that think their child walks on water. I hope that some of these strategies will help ease that tension. I would recommend this course to other coaches. I feel like no matter where you are in your coaching career, there are great strategies and eye opening points shared. I had attended a Joe Ehrmann 1-day seminar a few years ago to begin my transformational coaching journey, but I found the Jeff Duke, Mark Hull, and Wes Simmons video presentations a great reinforcement of and enhancement of those concepts. I had read BOTH 3D Coaching and InsideOut Coaching, but the guided reading [especially with Jeff Duke] enhanced the content of both.I definitely would recommend this course to other coaches, either beginning their journey OR looking to continue reflecting into their coaching [as I am doing before I begin my 19th season coaching football]. The strategies in dealing with people were the most valuable part of this course. I would recommend it, especially to new teachers and coaches. It gives them ideas on how to interact with people. 3D coaching provided me with a structure of how to assess what it is that was missing in my coaching. Reaching players at the 2nd and 3rd dimension will help me further my desire to be a quality coach.